Arguably Limerick`s most photographed attraction, the 13th-century castle stands to the right of Thomond Bridge and rises imposingly above the Shannon. The pentagonal fortress, with a main block, three round corner towers, a bastion, and a two-story gatehouse has been thoroughly restored and is the historic jewel in Limerick`s crown. A recent 21st century makeover to all its facilities is now a landmark not to be missed by visitors of all ages. With the help of an ultramodern and interactive visitor experience, a trip to the castle is more an exercise in time travel illustrating its dramatic history with over 800 years of stories. The many events in the castle`s fascinating history are illustrated in the attached interpretive center. It has everything from touch screen technology to 3D models; from discovery drawers to computer generated imagery, animations and projections. There are games and treasure hunts designed just for kids and they can even try on historic costumes like chainmail tunics or 18th century dresses. There is a spectacular, panoramic 360 degree view from the tallest turret. In peak season the castle courtyard bustles with authentic activities like a blacksmith`s workshop and a Norman campaign tent. Actors interact with visitors explaining their roles as a master mason, a constable and a moneyer in the castle`s mint. An exhibition center has been opened up for viewing and is now connected with an archway into the bowels of the castle so people can see the `great medieval hall` which was excavated in the 1990s. For history buffs young and old, some of the 1,000 items discovered during digs here are on display. Archeological excavations situated beneath the interpretative building have revealed pre Norman houses which predate the castle. There is also evidence of the traumatic castle siege of 1642. Mines and countermines used to destroy them, were exposed. In one clay tunnel, a period pistol was found. A reconstruction of one of the siege mines, also in situ, is an added attraction, enabling the visitor to experience something of the fearful atmosphere of those times. The courtyard displays some of the trades and traditions of the 16th Century. Visitors can also see the 13th Century undercroft of the officers` quarters which were excavated in 1993 to 1995. King John, as `Lord of Ireland,` minted his own coins and the Royal moneyer would have struck the coins in the castle mint. All the castle towers have been dressed to recreate the daily operation of a busy military castle and new additions also include a specially designed education room and for weary time travelers in need of refreshment, a café to relax in. Across medieval Thomond Bridge, on the other side of the river, the Treaty Stone marks the spot on the riverbank where the Treaty of Limerick was signed. 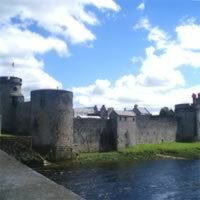 After Limerick was awarded its first Charter and Mayor in 1197 by Richard I of England, the Anglo-Normans wanted to make their mark on the city and fortify its defenses. King John was the brother of Richard the Lionheart, associated with legends such as Robin Hood and the Knights` of the Round Table. John, Lord of Ireland, though not as popular as his brother, was a formidable force in battle and when he set about claiming territory in Ireland, he certainly made his mark in Limerick. King John ordered a castle to be built and work started around 1200, going on for over a decade. 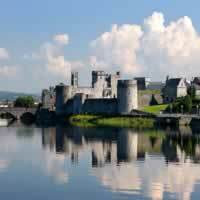 The castle was built on an existing fortification, the site of an original Viking settlement believed to date back to 922 AD, in the oldest part of Limerick with a good vantage point up and down the river. It was a magnificent feat of construction and ended up in the thick of some major historical events. Though it was attacked many times, its high outer walls, corner towers, battlements and gate towers remain intact along with numerous other features. 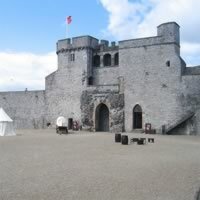 In 1642 the Great Siege devastated Limerick and the castle. Siege mines weakened the front wall (East curtain wall) of the castle and counter-siege mines carried out during the later and subsequent sieges. To date over 1,000 objects were excavated including skeletal remains of the siege period. You can view the remains of a medieval garrison and soldiers quarters recently discovered close to the sallyport area of the castle. A number of houses believed to be Viking in origin were unearthed during earlier restoration of the castle are also worth seeing. Between 1690 and 1691 the Williamite sieges led to the signing of the Treaty of Limerick. You can clearly view the Treaty Stone, said to be the site of the signing of the document on the far shore of the river from the battlements of the castle. In 1791 the British Army built military barracks suitable for up to 400 soldiers at the castle and remained there until 1922. In 1935 the Limerick Corporation removed some of the castle walls in order to erect 22 houses in the courtyard. These houses were subsequently demolished in 1989 when the castle was restored and opened to the public. King John`s Castle retains many of the pioneering features, which made its construction unique for the day. Its massive gate house, battlements and corner towers await your exploration while the armory and its contents remain as evidence of its turbulent history.